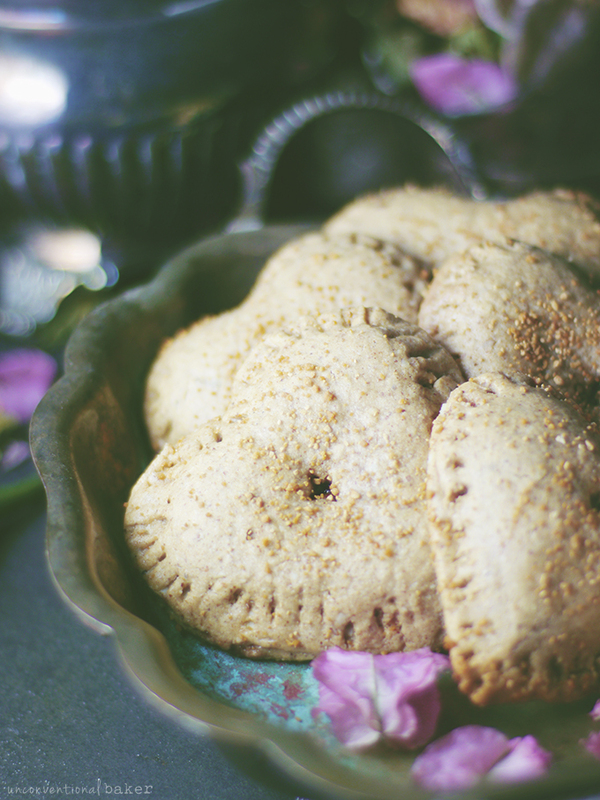 Today is the coldest day of the year here so far (-41C :S ), and that same sense of longing for something warm and comforting baking away reminded me that I’ve yet to share the recipe for these hand pies! 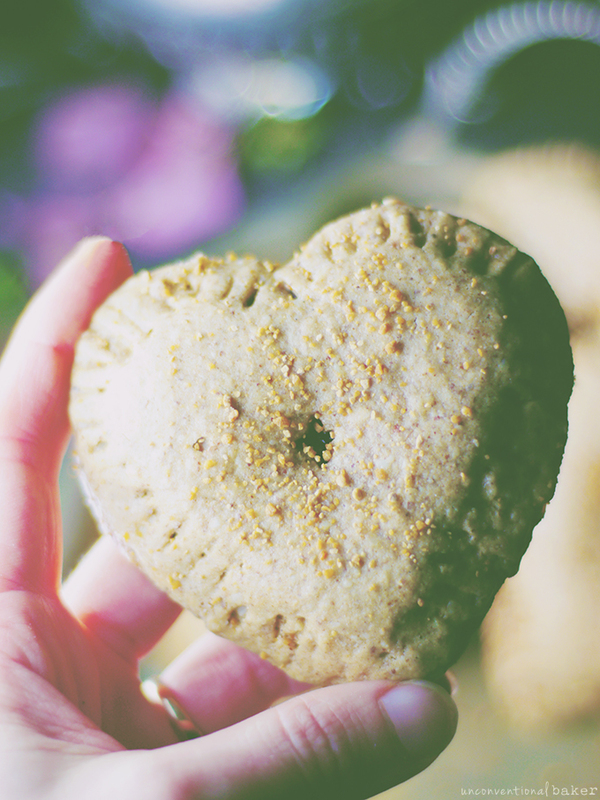 So here I am, sheepeshly giving you a heart shaped recipe two days before V-Day… eeeek. Oh well, the pies are truly delicious, V-Day or not, and always a good recipe to have in mind for a day you need something warm, sweet, gooey, fruity, and nutty to cozy up with. 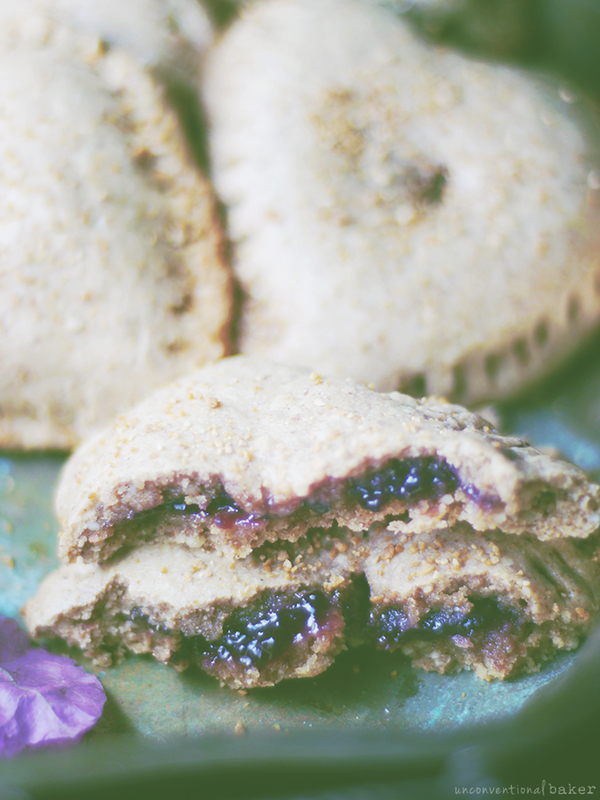 A classic gluten-free hand pie with an almond sorghum crust and gooey raspberry jam filling. Dairy-free. Process all cookie ingredients in a food processor into a uniform sticky mixture. Lump into a ball of dough and flatten into a disk. Roll out the dough flat into 1/16″. Use a heart shaped cookie cutter to cut out as many hearts as you can. Transfer 5 of them onto the cookie sheet, spaced about 1″ apart for easier handling. Spoon ½ tbsp jam onto the center of each heart, leaving the edges clean all around. Cover with any remaining cut-out hearts and pinch the sides closed by pressing down evenly all around with your fingers. Roll out remaining dough from the leftover scraps to create more hearts to cover remaining cookies and pinching the sides closed. Optional: use a fork to press the dough down along the edges all around. 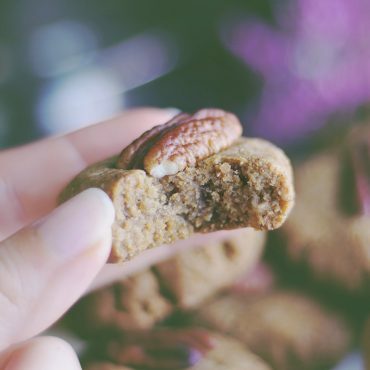 Use a knife to cut a tiny slit in the center of each cookie. Optional: sprinkle with raw sucanat if using. Bake in a pre-heated oven for 15 mins. Cool completely on a wire rack and enjoy! Disclaimer: this post contains an affiliate link to the raspberry jam I used in this recipe. 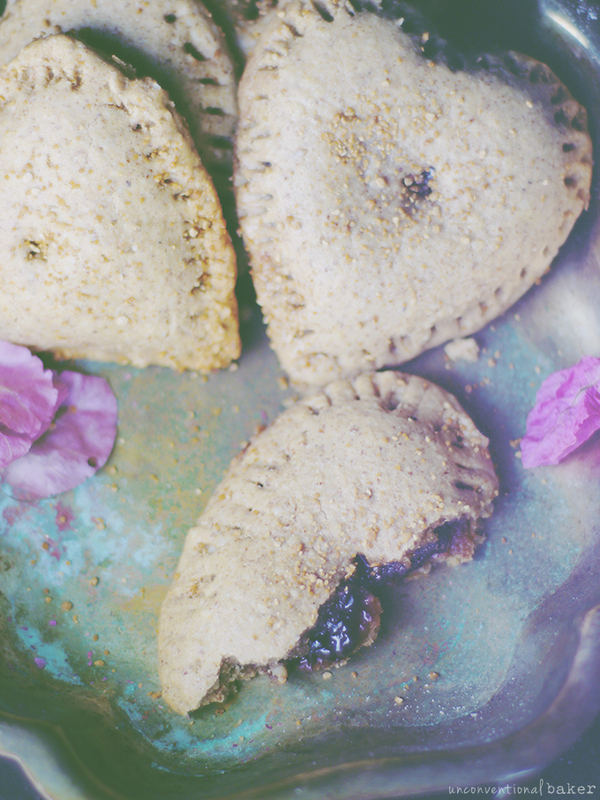 I made these lovely hand pies & the dough tasted just right & the filling was yummy! Thanks so much for the feedback, Sophie! :) I’m glad you enjoyed them. Hey, Audrey, I know you already said that most flours would work for this, but I thought I should ask anyway to avoid an awful mess in the kitchen :) Do you think I could use oat flour in place of the almond AND sorghum? Or would a mix of almond and oat be better? This is just the recipe I was looking for too, by the way. I just picked up some fresh raspberries from the market and have never tried the raspberry almond combo, but I love both, so I think they would be delightful together. Thanks! Sorry for the delayed reply. I think all oats might work, but you’ll lose a lot of the flavor as the almonds give the dough a nice taste. I think a mix of almond and oat would be fine though. If you try it, I’d love to hear how all oat turns out. If you like the raspberry almond combo, there are a few other recipes on the blog inspired by that flavor. These turned out great & look so impressive coming out of the oven! I made mine in circular shapes from a glass as it was all I had on hadn’t & they still looked so adorable!! I also used a quick homemade raspberry chia jam & it worked perfectly if anyone else is wondering if homemade jams work out as filling. Can’t wait to play more with this recipe & experiment with different shapes & fillings! So sorry I missed your comment earlier somehow — but thank you so much for the beautiful feedback. I’m really glad to hear you liked these :) And extra thick jam sounds fantastic! Love these Audrey! They are adorable! 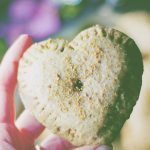 Oh yes, I can imagine the heart plethora with your little ones :) And yes, lots and lots of pies to warm my hands ;) Luckily it’s getting a little warmer here again. Phew. Hehe. Thanks Jasmin :) I agree — no wrong day to enjoy these. your heart cookies look absolutely cute and yummy, I will def. try the recipe. My recipe-to-do- list is getting longer and longer… :-D haha! I love that these cookies are filled with jam. Hi, these look delicious. I wonder, could I use buckwheat or brown rice flour in place of the sorghum pleade? Hi Jenny, yes, rice works well. I prefered it with sorghum personally, but made it both ways and both worked great. I had a friend make them with spelt (not gluten-free) and they turned out perfect, so I’m sure most flours will work. Enjoy them! I like that you still make / eat some baked recipes – variety is always nice and life is much more flexible when you have an array of choices! These look really delicious and perfect for any holiday, Christmas, Valentine’s or other. Thanks so much, Kari! And yes, absolutely. Some years ago (after experimenting with so many ways of eating) I came to the realization I’m done with the diets and done dealing in absolutes. Just eat more intuitively and what feels right. I do naturally love all things raw so that’s what most of my day (and desserts) tend to be. But baked / cooked is never excluded. Definitely a fan of variety. These look like those little “uncrustable” sandwiches! Although, much prettier and heart shaped ;) Love the raspberry jam…one of the best jams! 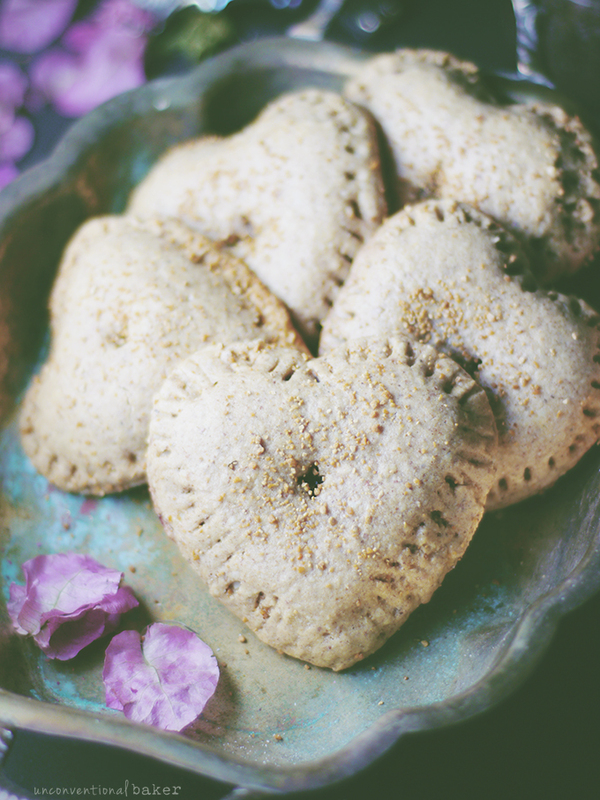 I am not such a Valentine day fan either, but I love hearts and all these little things around… and I am in love with your recipe! 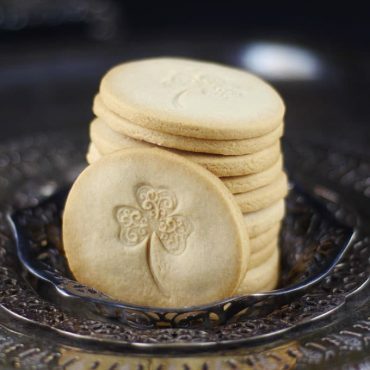 Sorgum is one of my favorite flour in cakes, love its interesting and exotic taste. Beautiful creations, thanks for the inspiration, Audrey! Oh, you’re most welcome :) I’ve been having fun with sorghum lately and loved it in this. Such a delicate flour.